I must admit I love the BBP Hybrid Hampton bag, possibly my favorite of the year, in terms of style at least. BBP’S Hybrid Hampton is the company’s flagship laptop bag featuring the Bak2Pak system that converts from a backback to a messenger bag in no time at all. I’ve been on the lookout for a bag that is cool enough to be hip ‘with the kids’ while grown-up enough to take to business meetings without feeling like mutton dressed as lamb. And this bag is what I’ve been waiting for. Note: It’s Bag Week on CultofMac.com. We’re checking out some of the latest and greatest bags on the market. Read all the bag reviews here. The Hybrid Hampton is available in small (12″ & 13″ MacBooks), medium (15″ MacBook), large (17″ MacBook) and XL (17″ Macs plus some); and in a variety of colors. 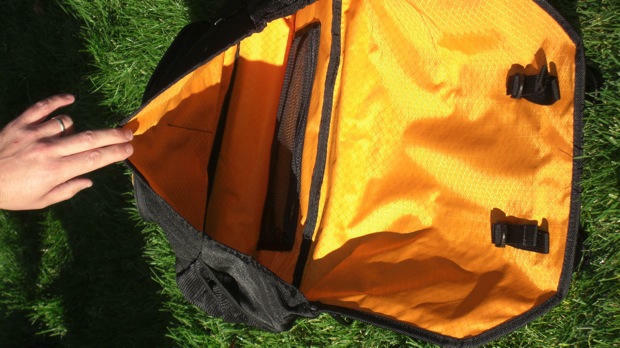 The bag has numerous compartments both inside and outside so all your tech gadgets can be kept organized and safe from rattling around the bottom of your bag. 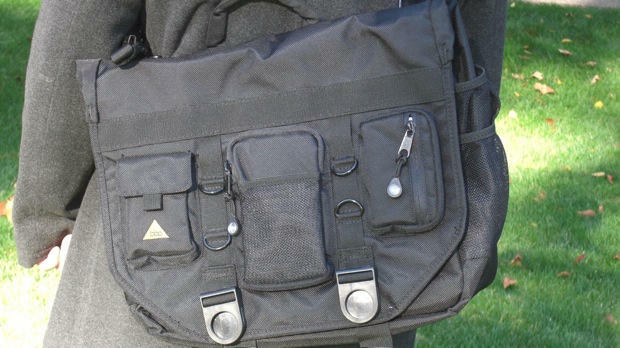 One of the best features is the dedicated laptop compartment at the rear of the bag so you can easily remove your computer without accessing the main bag. The zipper for this compartment is waterproof of course, as is the entire bag (which is essential when protecting your precious Mac). The Hampton can be carried in one of several ways, depending on your personal preference: Reinforced grab handle (business); Messenger style (edgy); Backpack style (Geeky) amongst others. The latter two ways of carrying are both easily achieved with the same adjustable strap, which also includes a stabilizer for cycling. One gripe with the strap is that it is slightly too long and if you prefer to hang your bag higher up your back, this is not possible. The shortest configuration just about works for me though after making a number of changes to the strap set-up. The backpack style is not for me, but it’s nice to have the option should it become necessary. (I found that the plastic buckle digs into your back, though). The backpack sits very low on your back, though this design is easier on your back muscles, apparently. The bag also has a luggage handle pass-through, allowing you to carry your bag mounted on top of a travel bag with an extended handle. The bag is sturdily made (it comes with a lifetime guarantee), which makes it a little heavier than the average bag but not so heavy that it’s an issue. One annoying caveat that drove me crazy however was the fact that the bag will not stand up on its own when you put it down, it topples over to one side like a drunk leaving a bar. But that’s not a deal breaker for me. Update: BBP has redesigned its lineup of laptop bags by adding the Industries High-Back Messenger and Industries Backpack. Both new bags are made of tough textile exteriors with eco-friendly thermoplastic elastomers (TPE) backing instead of environmentally harmful PVC. Buy Now: The BBP Hampton Hybrid is available from Amazon for $95.00.